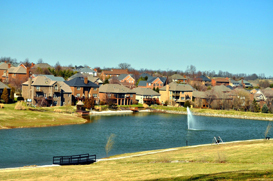 Firebrook real estate is located along the southwestern edge of Lexington, Kentucky. Many residents choose this community because of the tranquil setting Firebrooks homes are set in. Houses look out over pastoral lands while enjoying the amenities of pools, lakes, tennis courts, and the local clubhouse. It also has the advantage of being only a short drive from Bluegrass Airport and the metropolitan area of Lexington (via Highway 68). If these features aren’t enough, Firebrook real estate also provides stately properties with a brick pathway that meanders through the trees to the doorstep. Also nearby are lakes and a jogging trail that offers a peaceful round of the neighborhood.Within the Firebrook neighborhood, is the Firebrook Clubhouse. Inside, you can enjoy the warmth of the fireplace, watch some television on the big screen, and relax on a sofa before entering the pool area. On the other side of the clubhouse, the room opens to a ballroom filled with vaulted ceilings and classic French doors. Many residents use the ballroom for social events, and is always open to the public. The best advantage of Firebrook comes from the location. Only a short commute from Lexington, residents are free to enjoy all the festivals and shopping the city has to offer. Places like the Kentucky Theatre are a popular destination, as it’s a historic cinema that shows both foreign and Hollywood films. Average Price per Sq.Ft. : $109 sq.ft.